ST. GEORGE — During the first day of its 187th General Conference, The Church of Jesus Christ of Latter-day Saints announced a new Relief Society presidency and a reorganized presidency for its children’s “Primary” program. Jean Bingham, Sharon Eubank and Reyna Aburto will oversee the Relief Society, a women’s organization dating back to the founding of the church. 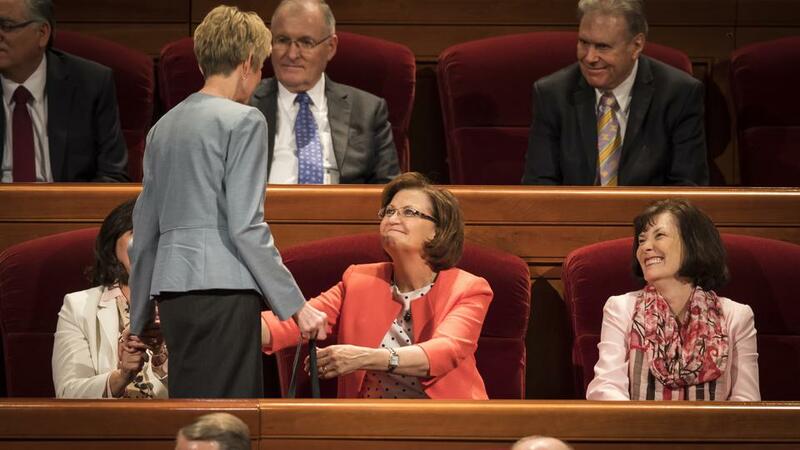 Prior to her call, Jean Bingham was serving as first counselor in the Primary general presidency. Bingham is the 17th general president of the Relief Society. In addition to her tenure as first counselor in the Primary general presidency, she also served on the general board of the Primary. Jean Bingham and her husband, Bruce Bingham, have two daughters and five grandchildren. Eubank was employed as the director of LDS Charities, the humanitarian organization of the church, and will continue in that role while serving in the Relief Society. She served on the Relief Society general board from 2009 to 2012. Reyna Aburto was born in Nicaragua to Noel Blanco and Delbi Cardoza and married Carlos Aburto of Mexico in 1993. They have three children and two grandchildren. She served on the Primary general board from 2012 to 2016. The Relief Society oversees the activities of all LDS women over 18 years of age. The Primary presidency also experienced some reorganization with Bonnie Cordon, who previously served as the second counselor in the Primary presidency now being called into the position of first counselor. Cristina Franco will be the new second counselor. Cristina Franco was born and raised in Buenos Aires, Argentina, and married her husband, Rodolfo Franco, in 1978. They have three sons. The Francos recently served as missionaries for the church in Resistencia, Argentina. Cristina Franco served on the Primary general board from 2005 to 2010. The Primary directs the Sunday School lessons and other activities for children ages 18 months to 11-years-old.